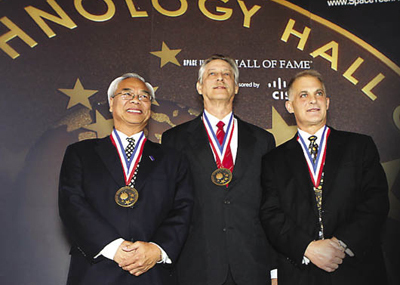 From left to right, Tinh Trinh, Ray Schwarz, and David Wolf were inducted into the Space Technology Hall of Fame in 2011 for their invention of the NASA rotating-wall bioreactor. During a ceremony at the Space Foundation’s 2011 National Space Symposium, the Space Technology Hall of Fame inducted a rotating device developed by NASA inventors to grow specimens of living tissues. Developed in 1986 by a group of NASA engineers and researchers at Johnson Space Center, the device, known as the bioreactor, enables the growth of tissue, cancer tumors, and virus cultures outside the body in space and on Earth. Three of the co-developers of the bioreactor were also inducted into the Hall of Fame: David Wolf, NASA astronaut, physician, and electrical engineer; Tinh Trinh, senior mechanical engineer, Wyle Integrated Science and Engineering Group; and Ray Schwarz, chief engineer and co-founder of Synthecon Inc. The bioreactor is a NASA spinoff technology that entered the commercial world when Synthecon licensed it in 1993. Regenetech Inc. (Spinoff 2009) also licensed patents from Johnson to produce three-dimensional tissues in the bioreactor. Regenetech, through a special NASA agreement, provides the technology in the form of its Intrifuge CellXpansion technology to researchers pursuing rare disease treatments. Organizational inductees for the bioreactor in 2011 are those that developed the technology and refined it for commercial use: Johnson, Regenetech, and Synthecon. All three are based in Houston. Also inducted into the Hall of Fame were commercial Earth-imaging satellite companies GeoEye Inc. and DigitalGlobe Inc. (Spinoff 2010). Applications for Earth-imaging satellites include agriculture, geology, forestry, conservation, education, and seismology among others. In the case of DigitalGlobe, the company has made use of NASA GPS technologies to support its imaging capabilities. Established by the Space Foundation and NASA in 1988, the Space Technology Hall of Fame works to honor the innovators working within and in partnership with America’s space programs and who create technologies that provide life-changing benefits on Earth. Many NASA spinoffs have been recognized by the institution, including medical devices, telecommunication technologies, environmental preservation solutions, and consumer products. 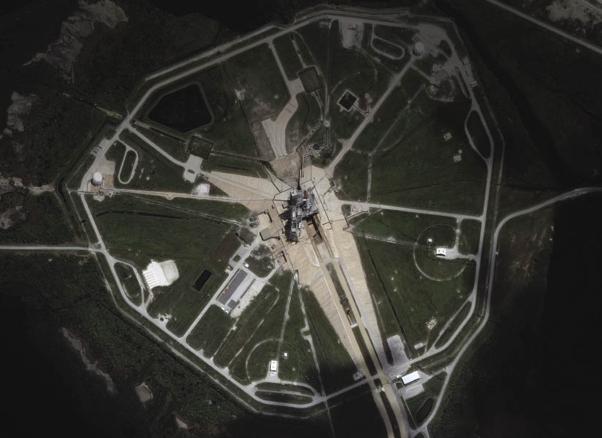 The space shuttle launch complex at NASA’s Kennedy Space Center, as seen from a DigitalGlobe satellite. DigitalGlobe was inducted into the Space Technology Hall of Fame in 2011. NASA was honored for its technology transfer achievements by the Federal Laboratory Consortium (FLC) at the organization’s 2011 national meeting. The honors included four national awards for “Excellence in Technology Transfer,” the FLC award for “Outstanding Technology Transfer Professional,” and as a member of a team receiving the FLC national “Science, Technology, Engineering and Mathematics (STEM)” award. As part of these awards, there were 17 individuals specifically named and each received a letter of congratulations from NASA Administrator Charlie Bolden. 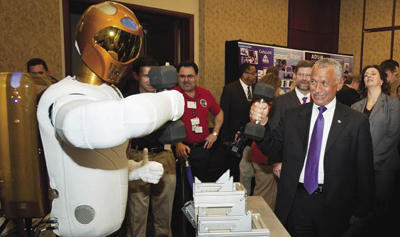 NASA Administrator Charlie Bolden works out with Robonaut 2 at NASA’s 2011 Technology Day on	Capitol Hill. This Robonaut’s twin was unpacked for duty onboard the International Space Station on the same day. NASA received four FLC national awards for “Excellence in Technology Transfer,” including one each for Glenn Research Center and Johnson Space Center, and two for Langley Research Center. Three individuals at or affiliated with Glenn—Robert Romanofsky, Kevin Lambert, and Paul Gierow—were recognized for collaboration in the development of an inflatable and deployable communication antenna system for future spacecraft missions and adapted for disaster relief efforts and military operations. Commercialized by GATR Technologies, the innovation has provided essential communication links in the wake of Hurricane Katrina and the 2010 earthquake in Haiti (Spinoff 2010). Two recipients—Ron Diftler from Johnson and Marty Linn from General Motors—were recognized for the design of Robonaut 2 for aerospace applications and automotive manufacturing. Robonaut 2 recently flew to the International Space Station to become a permanent member of the station’s crew. Two recipients—Qamar Shams and Allan Zuckerwar—from Langley were recognized for development and transfer of a portable infrasonic detection system used in measuring atmospheric events including microbursts, hurricanes, and clear air turbulence. Four individuals—Stanley Woodard, Bryant Taylor, Kathy Dezern, and Robin Edwards—from Langley were recognized for development and transfer of a safe wireless fluid level measuring system eliminating the risk of fuel or combustible fuel vapors coming in contact with any system components. 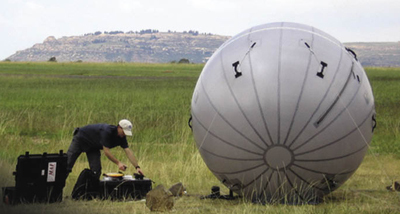 Honored by both the Federal Laboratory Consortium and R&D Magazine, the GATR inflatable antenna brings essential communications to remote areas, like this location in Lesotho, Africa. The “Outstanding Technology Transfer Professional” award was given to the Innovative Partnerships Program Office Team at NASA Goddard Space Flight Center. The award specifically identified five individuals—Nona Cheeks, Darryl Mitchell, and Bryan Geurts from Goddard, and Connie Chang and Dean Becker from Ocean Tomo LLC—for the innovative approach to licensing, using an auction format to highlight Goddard patents available for licensing. The “Science, Technology, Engineering and Mathematics (STEM)” award was given to an interagency team of NIH, NIST, and NASA for their work on a 2010 STEM Post-Doc Conference. The award specifically identified John Emond of the Innovative Partnership Office in the Office of the Chief Technologist for his involvement in the Post-Doc Conference and Career Fair. This is an annual forum designed to help post-doctorate fellows primarily in the Washington metro region of Maryland, Washington D.C., and northern Virginia, currently engaged in Federal research and development laboratories and nearing their term of employment, to continue their career growth through a combination of panel sessions and a career fair with companies based in the Washington metro area. The FLC is a national organization chartered by Congress to foster technology transfer from federal research labs to other agencies, state and local government and economic development organizations, academia, and the private sector and in so doing, aid the national economy. As part of its mission, the FLC recognizes laboratories and employees who have accomplished outstanding work in the process of transferring federally developed technology to the marketplace. NASA is a pioneering leader in researching, developing, designing and testing new technologies that benefit our world. The “R&D 100” awards, determined by the editors of R&D Magazine, honor the 100 most technologically significant new products created each year. This year, five different NASA technologies were included on this list. Four awards were given to NASA’s Glenn Research Center and one award was given to Johnson Space Center. These technologies are the GATR inflatable satellite communication system, the High Altitude Hydration System (HAHS), the low plasticity burnishing process, the spring tire, and the thin film ferroelectric high resolution scanning reflectarray antenna. The GATR Inflatable Satellite Communications System (Spinoff 2010) is a portable ground based inflatable antenna. It is available in sizes of 1.8–2.4 meters, and the system is created from flexible materials which allow it to be easily transported and deployed where needed. It can be set up and begin working within an hour. 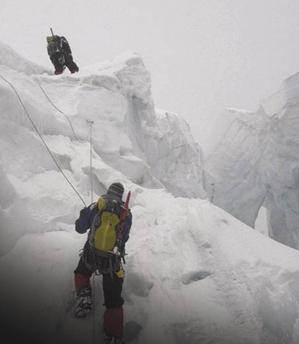 Former astronaut Scott Parazynski helped invent the “R&D 100” award-winning High Altitude Hydration System and tested it on Mt. Everest. 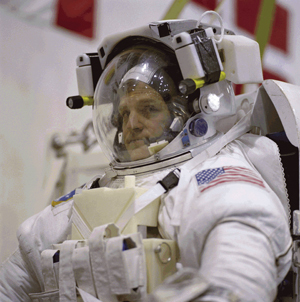 Parazynski is the only person to have both been in space and summited Mt. Everest. The GATR Antenna System provides immediate Internet, telephone, and cell phone access in emergency situations. This technology can be beneficial to military operations as well as during disaster relief efforts. GATR was successfully used in the United States’ relief outreach to Haiti in response to their devastating earthquake in January 2010. Bob Romanofsky (NASA), Kevin Lambert (QinetiQ North America), and Paul Gierow (GATR Technologies) were recognized for the innovation. The HAHS is a leak-proof container, worn in a backpack, which prevents water from freezing in low-temperatures, such as during high-altitude climbs. Worn on the body, the HAHS makes use of body heat to keep water in a liquid state. NASA-developed aerogel surrounds the container and the straw, offering further insulation. Tape heaters on the straw powered by a nine-volt lithium battery with a microcontroller can also be used with this system in the most extreme conditions to prevent ice accumulation. This technology could benefit law enforcement and military personnel, as well as outdoor recreationalists, like hikers, skiers, and campers. Astronaut Scott Parazynski (NASA), Grant C. Bue (NASA), Evelyne Orndoff (NASA), Mark E. Schaefbauer (Jacobs Technology), and Kase Urban (Jacobs Technology) were recognized for the system. Low plasticity burnishing greatly increases the resistance of metals to fatigue cracking at high temperatures. This can be especially important in rotating components such as those used in airplane turbine engines. This process, developed at Lambda Technologies (Spinoff 2010)through the Small Business Innovation Research (SBIR) Program at Glenn, is more affordable than conventional methods and produces superior results. The “R&D 100” award-winning spring tire, the outcome of a partnership between NASA and Goodyear, introduces a new concept of what a tire can be. Low plasticity burnishing produces a surface condition that increases the fatigue life of metals, and also increases their ability to withstand impacts. This technology can extend the life of aircraft in both the military and the commercial sector, enabling airplanes to remain in service longer. Ignacy “Jack” Telesman (NASA), Tim Gabb (NASA), Perry Mason (Lambda Technologies), Doug Hornbach (Lambda Technologies), Paul Prevéy (Lambda Technologies), and Pete Kantzos (Honeywell) were recognized for the invention. The spring tire reinvents the traditional concept of what a tire is. It is comprised of a network of coiled wires, which can safely and efficiently carry a vehicle over rough terrain—on Earth, on the Moon, on other planets. These tires offer a high resiliency and require neither rubber nor air. The load-bearing helical springs uniquely adapt to uneven ground and are not affected by extremes in temperature. 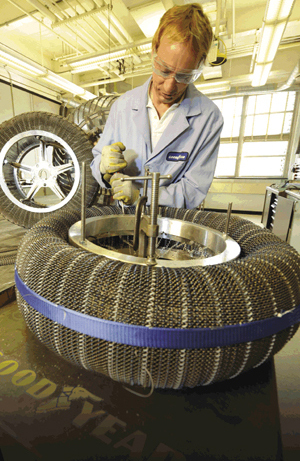 The tires, developed to be easily assembled for use, can be beneficial for space exploration as well as military operations that require travelling over various landscapes. They are not susceptible to puncture and can continue to properly perform even if damaged. The spring tire was created with the support of the Exploration Technology Development Program and the Innovative Partnerships Program. Vivake Asnani (NASA), Jim Benzing (Goodyear), and Jim Kish (Goodyear) were recognized for their spring tire research. The Thin Film Ferroelectric High Resolution Scanning Reflectarray Antenna uses innovative phase shifter technology to improve performance and reduce cost of electronically steerable phased arrays. 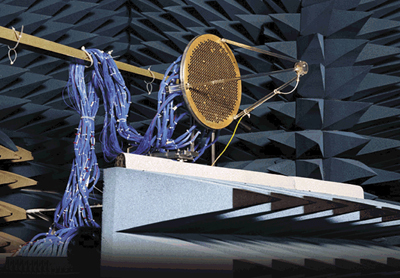 The system offers functionality comparable to conventional phased array antennas, while increasing efficiency and decreasing cost through simpler device fabrication and assembly techniques. This new technology could enhance space exploration to other planets, can improve radar detection of orbital debris, and can improve rendezvous and docking maneuvers of spacecraft. It also has terrestrial applications, such as developing collision avoidance radar systems for cars on Earth. Félix Miranda (NASA), Bob Romanofsky (NASA), Elizabeth McQuaid (NASA), Nicholas Varaljay (Ohio Aerospace Institute), and Frederick Van Keuls (Ohio Aerospace Institute) were recognized for the technology. The Thin Film Ferroelectric High Resolution Scanning Reflectarray Antenna is quite a mouthful to say, but the benefits the innovation can provide in space and on Earth are many. NASA’s Ames Research Center has won two Agency awards: the 2010 “Government Invention of the Year” award and the 2010 “Commercial Invention of the Year” award. 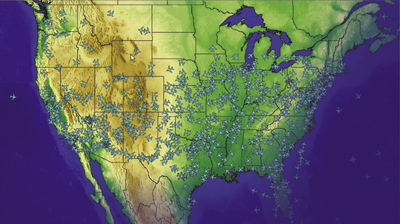 Ames received the Government Invention award for developing the Future ATM (Air Traffic Management) Concepts Evaluation Tool, or FACET, a software that creates simulations for managing air traffic scenarios (Spinoff 2007). Ames won the Commercial Invention award for developing a powder vibration system used in portable X-ray diffraction (XRD) instruments. Ames research scientist David Blake and former NASA post-doctoral fellow Philippe Sarrazin developed the technology, which was licensed to inXitu Inc. of Campbell, California. 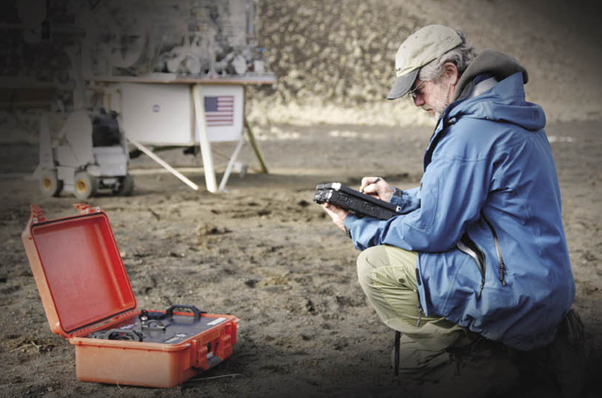 The powder vibration system enabled the development of a miniaturized soil and rock analysis instrument that has been accepted for flight on the Mars Science Laboratory, NASA’s next mission to Mars. Each NASA field center submits nominations for the awards, which are evaluated by NASA’s Inventions and Contributions Board. The board determines which nominations qualify for each category, ranks the nominees, and makes recommendations to the NASA Office of the General Counsel for review and approval. Ames previously won the NASA “Government Invention of the Year” award in 2008 for the invention of a high-speed 3-D laser scanner with real time processing. Space Technology Hall of Fame® is a registered trademark of the Space Foundation. Intrifuge CellXpansion™ is a trademark of Regenetech Inc. The Mars Science Laboratory rover features a soil and rock analysis instrument called CheMin, enabled by Ames Research Center’s powder vibration system for X-ray diffraction instruments. Here Ames researcher David Blake is collecting data from CheMin’s commercial cousin, called Terra. Terra is produced by InXitu Inc., which licensed the Ames technology.